It’s happened again … and it won’t be the last time. The parody DPRK News Service Twitter account has fooled someone and made it onto national television in the U.S. The subject in question was a couple of computer problems that hit United Airlines and the New York Stock Exchange on Wednesday morning. The United problem, which was blamed on a network router, caused a nationwide grounding of all flights that weren’t in the air while the NYSE glitch resulted in a 3.5-hour halt of trading. The tweet in question came just about 24 minutes after trading was halted, just as news services were beginning to report the story. The timing was perfect because it was before the NYSE and White House both discounted a cyberattack as the cause of the problem. New York stock traders paralyzed by revolutionary cyber vandals. People's Assemby Chairman Kim Yong-Nam praises computer soldiers for Juche! Heroic computer vandals shut down all operation of imperialist US United Airlines. Ten thousand years of life to Supreme Leader Kim Jong-Un! The two tweets evidently made the rounds and one of them eventually got to Greg Keeley, chief operating officer of computer security company Ghost Systems. 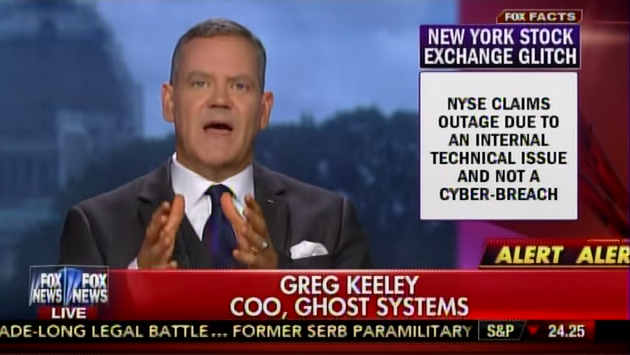 Keeley appeared on Fox News Channel to talk about the hacks. The U.S. government had already said it was not the result of a cyberattack, but clearly that wasn’t as convincing as, say, a random Twitter account. Putting aside the issue of whether it’s possible or not, the tweet in question wasn’t from North Korea. It was from a Twitter user called @PopeHat. Shepard Smith, a Fox News anchor, brought a little calm back to the discussion when he blasted people — including Mr Keeley — who were linking the attacks and sourcing information from Twitter. One of the reasons the DPRK News Service keeps getting mistaken for an official account is that it looks pretty official. The bio claims to be legit and it links to a legitimate KCNA website, albeit not the official one. The Japanese site is run by a DPRK-affiliated group in Tokyo. The KCNA site from Pyongyang is at www.kcna.kp. Another reason it’s often believable is that it imitates the bombastic language of KCNA and that its sometimes ridiculous-looking tweets play right into people’s idea of North Korean propaganda. But a look back through the tweets should be enough to indicate the account isn’t really official after all. Kim Jong Un enjoys art performance, with songs such as "Our General Provides Appropriate Freedoms" and "Let Us Bake Pie for the Revolution"
Still, Mr Keeley shouldn’t feel too bad.